From 2017 we will be running a Practical Shooting evening on site one evening a month. 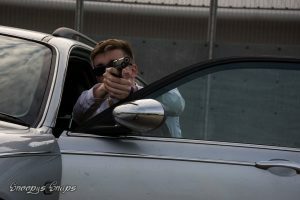 We hope that the Practical Shooting (PS) offered at The Gaol Events will form a multi gun-centric shooting sport based on simulated tactical and defence scenarios. The PS competition format is designed to be enjoyable for all shooters of all skill levels, with a premium put on the social interaction and camaraderie of the members. Participation in PS events requires the use of handguns, holsters, Rifles and Shotguns and other equipment suitable for concealed carry, self-defence and tactical shooting. With that in mind, and keeping the shooters’ best interests in mind, PS will use established Airsoft equipment that are based on commonly available firearms and gear, allowing individuals the opportunity to compete with minimal investment. Our main goal is to test the skill and ability of the individual and offer a fun sport with regards Target Shooting. We will have a min of 2 Courses to run each evening, with player’s times being recorded for each run through the course. These can be done in Pistol Only, 2 gun or 3 Gun options, with classes being devised for each element. Hire equipment will be available for those wishing to access the hobby of competitive shooting. Food will be Meatball Subs. Gates will open from 5pm and we will finish at 9:00pm. No safety brief is required, therefore, players can turn up at any time and run a course etc through the evening. Game dates are the first Monday evening of the month. The rules for the Practical Shooting Event can be found here. Please make sure you are familiar with them before attending.